The classic ones have the same the design scheme of typical plugs used with a spinning tackle. They are tied on a single hook and have a plastic blade pointed forward and down. The balance of the fly should allows it to move steadily during retrieve in the water — with vibrations or wiggling action (same as the normal wobblers or plugs do). The Antiwobbler has everything «back to front» — its blade is directed up, 180 degrees of the hook bend. When retrieved in the water this fly is coming to the surface with a wiggling action. This is an excellent imitation of a little fish trying to escape from a predator. The Belly-Up (Hook-up Bug) at first sight looks like a classic wobbler-fly; on the contrary its belly is light and the back is weighted. This makes the fly turning over and move with both the blade and the hook directed to the surface. The fly types 2 and 3 we will discuss later; now I want to focus on the classic wobbler-flies. 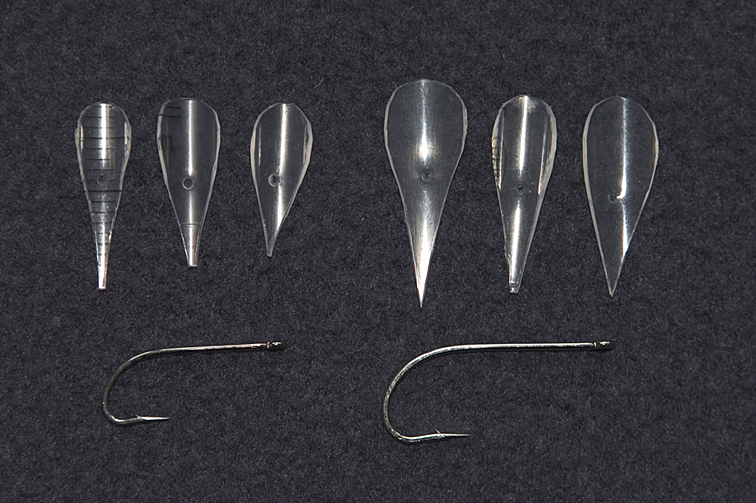 The «blanks» for the three main types of the wobbler-flies: classic wobbler fly (left), Antiwobbler, and Belly-Up or Hook-up Bug (right) The first of my wobbler-flies was a Wiggle Bug with a back and blade out of foam; this was a gift from one of my friends from USA. He had told me that this «fly» is used for bass. I wanted to make some similar ones, but at that time (1994) it was difficult hard to find hard enough foam for the body. I had to invent something different for the blade. Wiggle-Bug with a foam back I had tied several copies of the fly in contract colors. 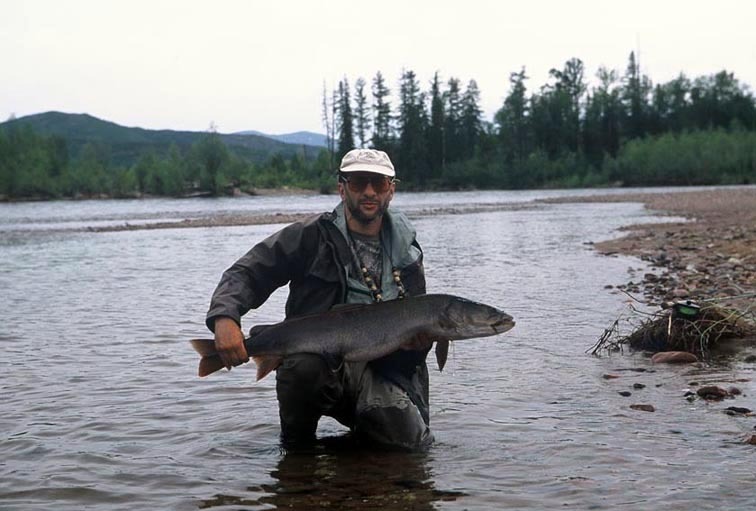 The Wiggle-Bugs were working great in any water conditions; they had helped me to catch numerous trophy lenok (Siberian trout) and some taimen. Their best use was during a rain-flood, in the coffee-with-milk water — only with fly with its vibrations was catching me good size fish. Wiggle-Bugs have both back and blade made out of hard foam. They are the variants of the ancient Flatfish plug During high flood in the Im River there was high rain flood; the normal flies were not working. The only one attracting the trophy lenok was a Wiggle-Bug made of a sole of foam slippers The same Wiggle-Bug is attracting taimen (Uchur R., Lena drainage). Now I am making the wobbler-flies mostly with a blade cut out of the tubes of plastic syringes. They could be presented on both floating or sinking line. 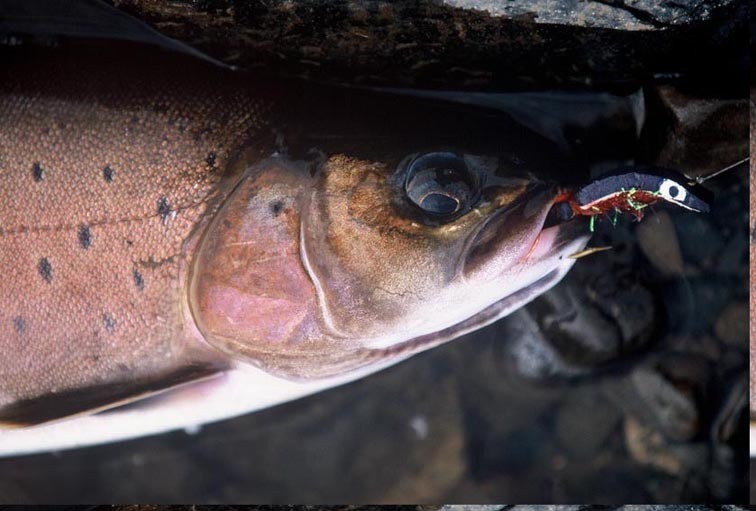 Fresh silver pink salmon was actively chasing the wobbler-flies of fantasy colors The use of a tiny, bright wobbler-fly with a sinking line is the best method of catching, silver sea-run Dolly Varden charr fresh from the sea. I wade out far into the riffle, cast downstream (or downstream-and-across), let the fly sink to the bottom, and start slow retrieve. The fly is vibrating near the bottom, and the running charr simply can not resist. 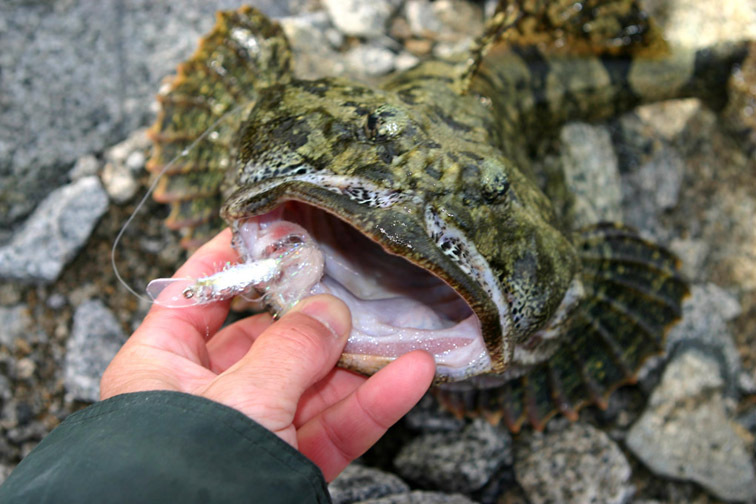 Marine sculpin from the Bering Sea The main difficulty in tying of these flies is their fine-tuning. I do it at home, in a bath-tub. The fly should have a stable action without turning over to its side or back. Rotating instead of wiggling is even a bigger fault. The tuning is done with cutting parts of the blade. Wobbler-flies were catching different fish species, including Kamchatka steelhead, Pacific salmon, taimen, lenok, grayling, pike, catfish and many more. These flies are tied on good size hooks which allows landing a trophy fish. The tippet also can be strong, up to 0,4 mm. 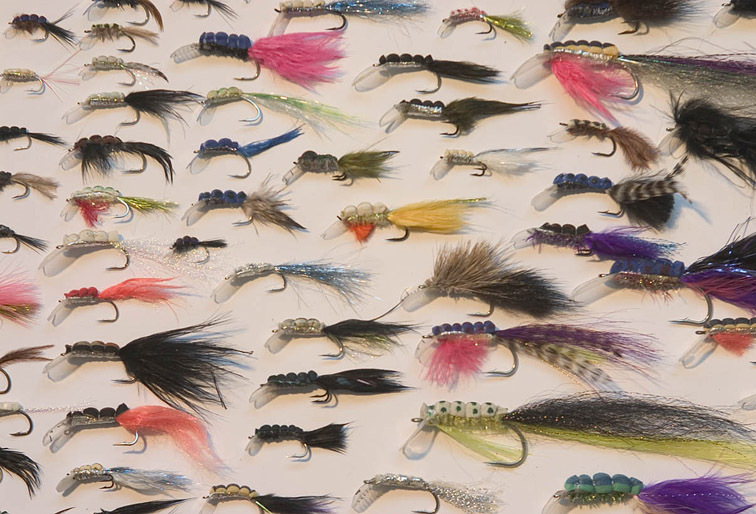 The main parts of a typical wobbler-fly are hook, blade, tail, body (wrapping of the hook shank), and foam back. Wide selection of the hooks with medium or long shank and straight eye could be used. Some of my flies I tie on salmon fly hooks, singles or doubles. The blade is set on the hook before the other parts of the fly. The hook should go through the little hole punctured in the middle of the blade billet. I begin with the «active» part of the blade bigger than is should be for the fly of the given size — the extra parts of the blade will be trimmed during the fine-tuning. The blade of the smallest flies I make out of thin clear plastic; they could be cut out of a plastic water bottle. The narrow part of the blade is bent to the hook back and secured by numerous wraps of 0,1 mm mono line. Generally I am using the thin mono to tie most of my flies. 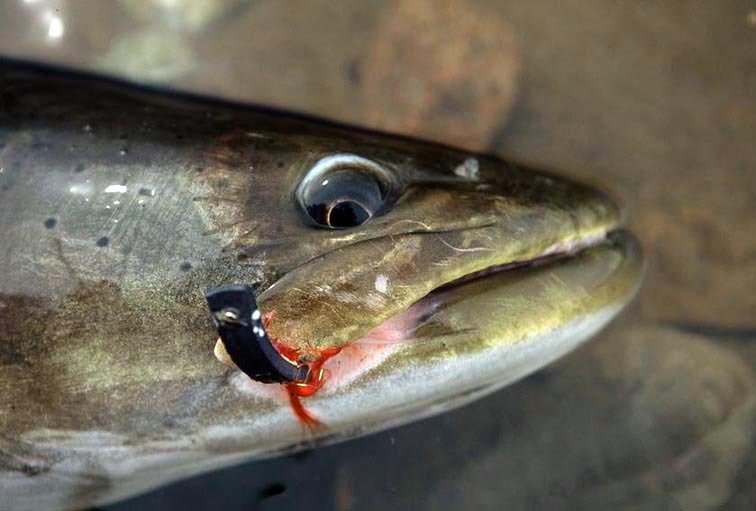 The using of the mono line is especially important for the big flies, for the ones which should be clear, and also for the flies which should withstand the teeth of the predators. The flies tied with mono are much more durable; if necessary they could be transparent. Ever comparatively small wobbler-fly attracts Siberian taimen(Uchur River, Lena drainage) An example of the blade billets made out of a syringe. Note that these billets are bigger than the blades for these hooks should be. The intensity of the fly movements, its agility, depends on the blade surface, and also on its body design. Lazy, slow-moving flies become more agile in strong current, or on swift retrieve. The flies designed for stagnant water have big blades; many of them are not good for using in strong current.